ISLAMABAD: Almost 80 per cent agro farmland in the federal territory is being used in violation of terms and conditions of the Capital Development Authority (CDA). The CDA Chairman informed the Supreme Court (SC) on Monday in a case regarding illegal use of agriculture farms in the capital. 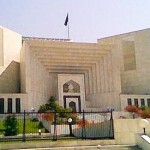 A two-member bench of the apex court, comprising Chief Justice of Pakistan Iftikhar Muhammad Chaudhry and Justice Ghulam Rabbai is hearing the suo moto case of illicit use of land. Appearing on court’s notice, the CDA Chairman Imtaiz Inyat Elahi stated that he had conducted a survey of these agriculture farms after the issuance of notice by the court. He informed that 80 percent allotees, who got land for agriculture farming, were violating the terms and conditions and using these farms for other purposes. The chairman also said that 610 agriculture farms were allotted to different people, adding that three allotees had converted the agro-farms into marriage centers, which was a nuisance for people of that locality. He also told the court that allotees had approached the civil courts for stay orders after the apex court served them notices. “They have got stay order from civil courts. We had constituted a committee to examine each case of the agriculture farm,” he maintained. While appreciating the court’s interest, he said CDA had retrieved 13,000 kanal land due to the intervention of the apex court. The CJP observed that everything should be done in accordance with rules and regulations and this was what the court wanted. The court directed the civil courts that are hearing the cases of agriculture farms to expedite the cases so that the CDA could proceed in this matter. The court also issued notices to three marriage halls owners for causing nuisance to the neighbours, besides violating the terms and conditions of the CDA. On the last date of hearing, Justice Javed Iqbal had said in his remarks that the main purpose of the agriculture farms was to provide milks, eggs, fruits and vegetables to the citizens of capital but palaces had been constructed there instead. He also observed that the court would examine the CDA procedure of allotting the land for agricultural farms, since the CDA had relaxed its rules at the time of allotment.